A minor or major kitchen remodel is a popular way to reinvent your space. The National Association of Home Builders has found that 69% of all jobs were related to kitchen remodeling. The popularity of kitchen renovations is second only to that of bathroom upgrades — but your kitchen is a hub for both family and friends, a place to hang out and relax. In terms of impact, a kitchen remodel has a whole lot more potential. Even a minor kitchen upgrade can offer a significant return on investment: up to 82.7%, on average. 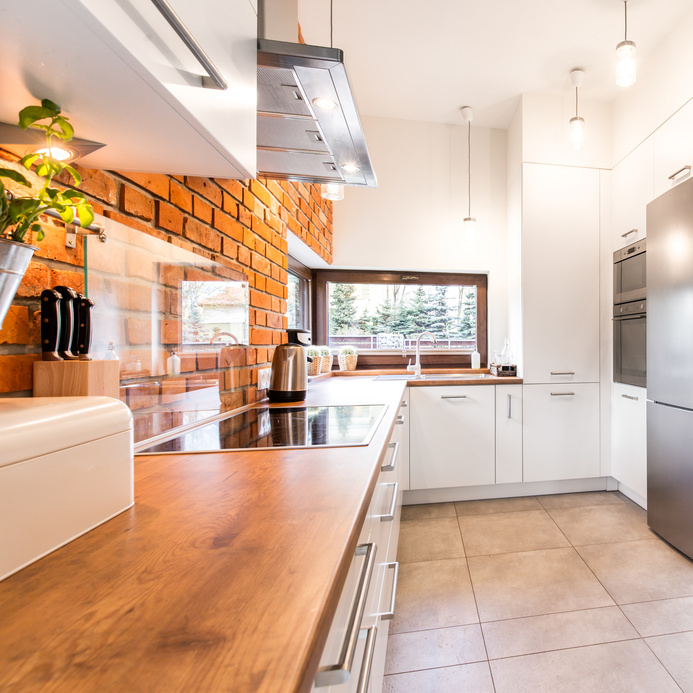 If you decide to redo your kitchen, not only will you be left with a fresh new space to enjoy; you’ll also be looking at a higher market value for your home. One of the most common ways to update your kitchen is to replace the backsplash. Today, a backsplash isn’t just a functional way to protect walls from stains and splatters. When executed well, a new backsplash can create a focal point for your entire kitchen, shifting the aesthetic and redefining your space. Here are some creative kitchen backsplash designs guaranteed to make a splash in your kitchen. Go antiquing. Vintage materials can be salvaged to create a one of a kind look for your space, and you can be as creative as you like. Antique boat wood can be a great option for earthy mosaic tile designs, and it will already be waterproofed! Using a more traditional hardwood as a backsplash tile material would also bring in warmth, and would look especially striking paired with a concrete floor and stainless steel appliances. A mirror image. Add a modern touch and make your space feel larger with a tiled mirror backsplash. To add character, consider using antiqued mirrors for a more subtle reflective effect. Your kitchen could be the fairest of them all! The Tin Man. Bring texture into your backsplash with embossed tin sheets. Embossed concrete is another great textured option, and would be best for those looking to bring some formality into their kitchen space. Choose from endless designs, and tile away! Go all the way. Make a real statement by extending your backsplash tiles all the way to the ceiling. Traditional white ceramic subway tiles and natural stone backsplash tiles would be especially striking and sophisticated. Go in circles. Tile options are overwhelmingly rectangular, with occasional hexagonal options thrown in the mix. Consider rounding out those corners to give your space a more organic feel. Small, circular tiles can add visual interest and fit in virtually any space. Build a castle. Add depth to your space with richly colored stone backsplash tiles. Draw inspiration from ancient European castles to make your kitchen fit for royalty. Embrace Mother Earth. River rocks pebbles are a common inspiration for shower floor tiles, but incorporating tiles with such free-flowing edges and organic shapes can balance hard verticals and horizontals in your countertops and cabinets. River rock stone backsplash tiles will bring the outdoors in, in the best way. Rustic chic. Consider quartzite sandstone tiles for a rustic, roughly-textured, backsplash, guaranteed to make your kitchen warm and inviting. King me! If you’re tired of mosaic backsplashes but you crave a patterned kitchen, check out marble checkerboards to add whimsy and drama all at once. Another brick in the wall. Use a deep-hued glazed ceramic tile to create the illusion of brickwork while reflecting light to add dimension and contrast to your space. Mix and match. Can’t decide on a tile material? Multimedia backsplashes can be some of the most striking and innovative. If two different tiles catch your eye, don’t be afraid to incorporate both! Stone backsplash tiles combined with glimmering glass; Marble accents on ceramic; anything is possible. Just keep in mind the materials featured in the rest of your kitchen — take flooring, appliances, countertops, and cabinets into account, and choose a material (or materials), style, and design that will bring everything together. Now you’re ready to take on your kitchen backsplash with confidence — and a little panache!